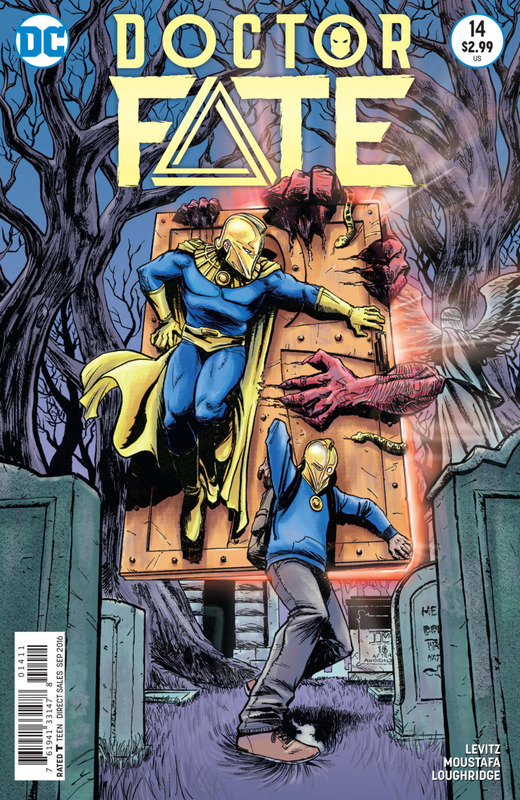 I'm digging the latest Doctor Fate series. But issue #14 has taken my love to an all new level. The addition of the previous Fate (revealed as something of an uncle to Khalid) finally gives the new Fate a mentor ... more or less. But the creative team has not given up on Khalid's family's experience as Muslim-Americans either. It's not quite to the level of Denny O'Neil and Neal Adam's socially conscious run of Green Lantern/Green Arrow in the 70s, or even G. Willow Wilson's Ms. Marvel, but it's good to see DC expanding their universe in this fashion. 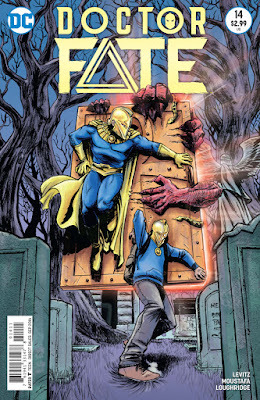 Both stories in this issue were written by series regular, Paul Levitz. However, this issue features two guest artists. Inaki Miranda for the first story (the first two images below), and Breno Tamura for the backup (the remainder of the images). [After SDCC 2016] -- Last week, we were at the San Diego International Comic-Con. And that weekend's Flashback post featured tune selections by my fellow SDCC bloggers/tweeps. 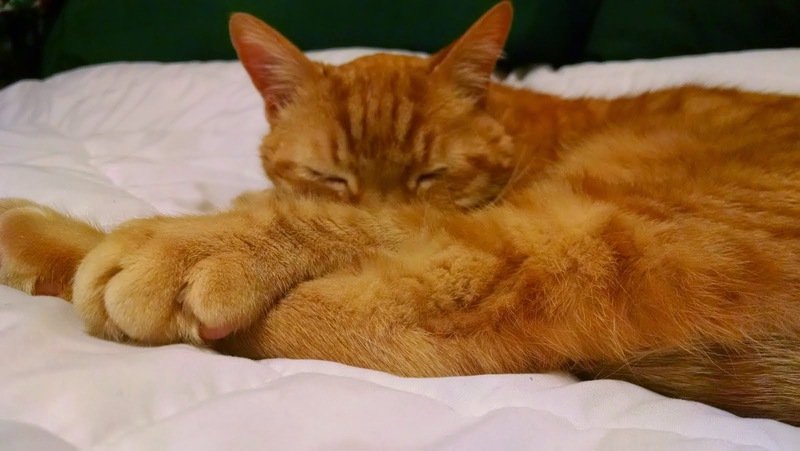 Well, I have a few suggestions left over, so I figured I'd use them for this week's post. Why? Because in addition to TV shows, movies, and comic books, I also nerd out about 80s music. But you knew that already, didn't you? That's why you come here (all two or three of you; I lost count). So here, with some help, is my second SDCC Mix Tape. Read and hear more after the break! The Countdown to SDCC 2017 Begins Now! 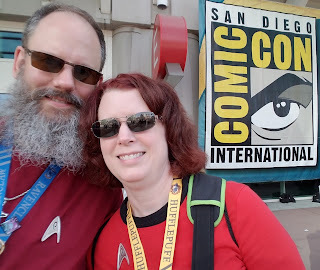 SDCC 2016 ended on Sunday, July 24, but we stayed in the area for a few more days. So, the whole San Diego experience ends for us today because we are flying back East this morning. Therefore, the countdown to the next SDCC begins in earnest for us today. 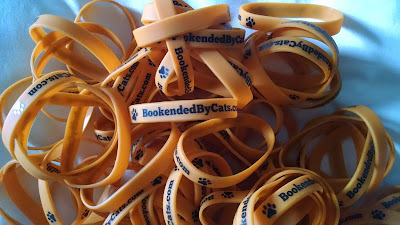 Be on the lookout for a few post-SDCC write-ups from us here at Bookended By Cats. In the meantime, we hope to stay in touch with all you fellow nerds virtually. [SDCC 2016] -- I'm at the San Diego International Comic-Con this week. 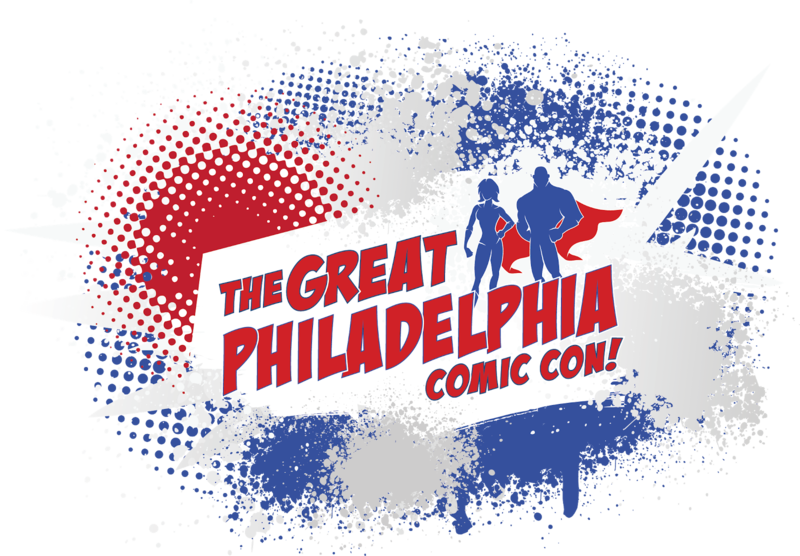 And this Nerdhalla is not only great for learning the latest in TV and film, tracking down your favorite comic book creators, and finding cool swag, it's also great for meeting (or reconnecting with) online folks in real life. For example, we attended the Game Of Bloggers meetup Wednesday night. So, this week on the Flashback, I thought I would turn over the tune selection to my fellow SDCC bloggers/tweeps. I asked them what their favorite 80s tune is. 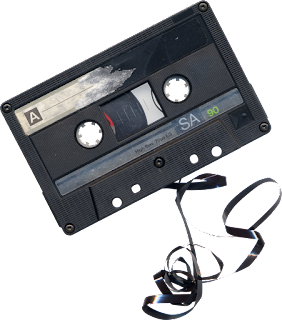 And now, in no particular order, I give you my very first SDCC Mix Tape. Read and hear more after the break! Bookended by Cats Returns to SDCC! It's so good to return to San Diego for the Nerdhalla known as SDCC! 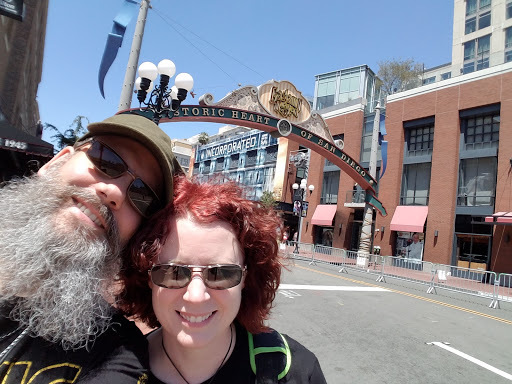 Gods, we've missed this con and the surrounding area, such as Gaslamp District which is behind us in this photo. Tonight we have Game of Bloggers Season 2, and tomorrow our con madness begins in earnest. 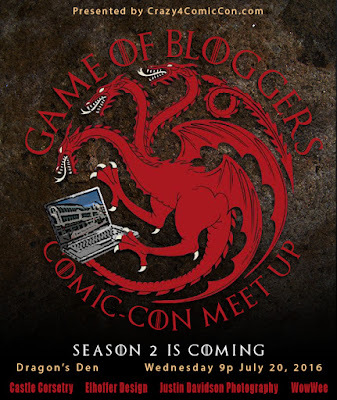 Game of Bloggers Season 2 at SDCC 2016! They said it couldn't happen twice in our lifetime, but Season 2 is coming. 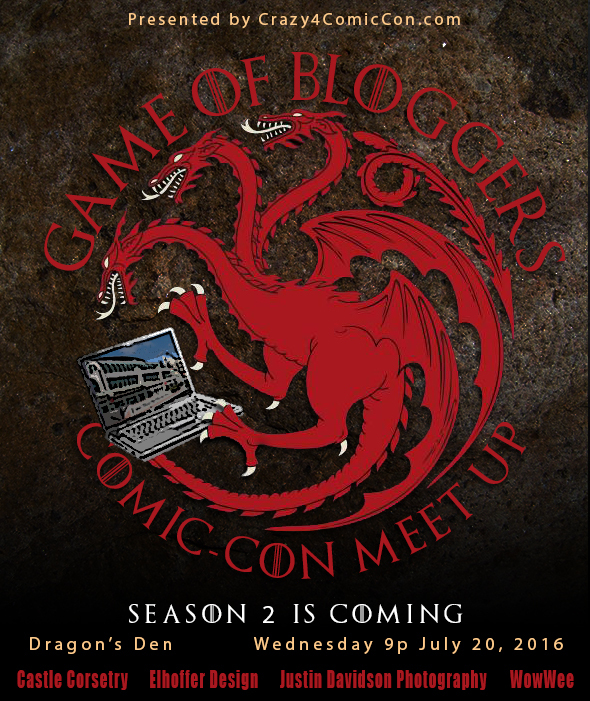 That's right, just one year after the debut of Game of Bloggers on SDCC 2015's Preview Night, it's back for more Nerdhalla Meetup Madness! So, for our sixth consecutive SDCC, we will be part of the second Game of Bloggers Meet-Up hosted by the one and only Crazy 4 Comic Con! 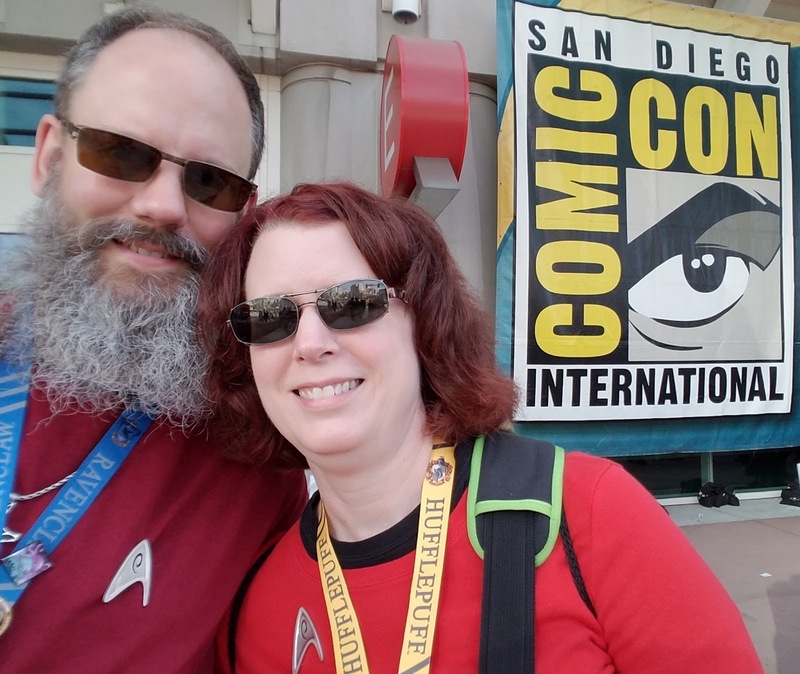 If you're going to SDCC this year, and you're free on Preview Night (Wednesday July 20th), come join us and more cool-and-nerdy bloggers than you can shake a sonic screwdriver at! Oh, and Crazy 4 Comic Con will have his recently launched Hero Within Fashion Collection on display and you won't want to miss that. 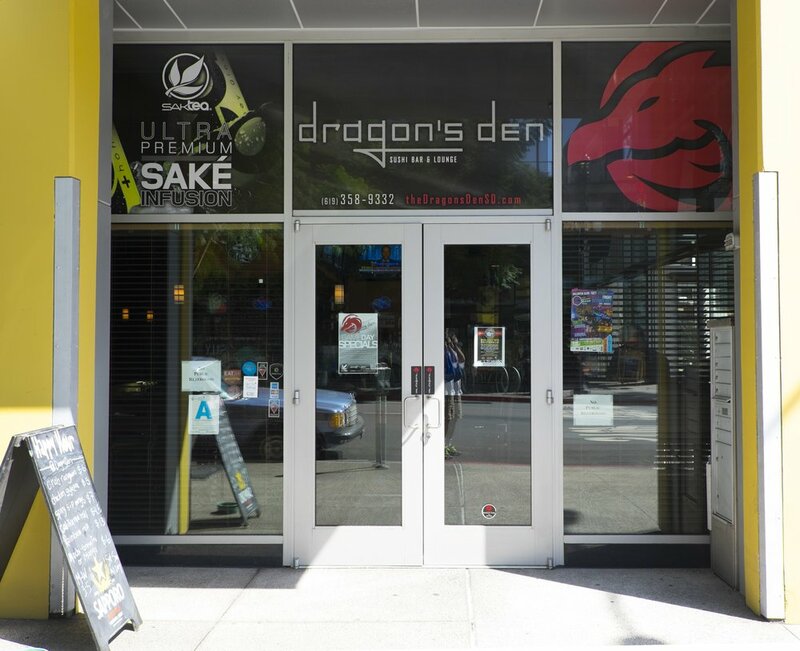 The party returns to the patio & bar of the Dragon's Den (315 10th Avenue; next to Petco Park). Oh, and it's FREE! Free as in ... well, Free! The basic info is below, but if you need more details an sponsor info, go visit Crazy 4 Comic Con's post. [Da Da Da] -- I wasn't certain what I wanted for the Flashback this week until midway through the week itself. For some reason, "Da Da Da" by the German band, Trio, got stuck in my head. 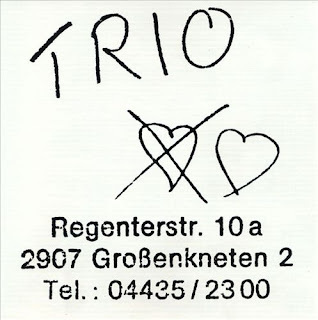 Now, Trio formed in Großenkneten in 1980, and released their first self-titled album in 1981. 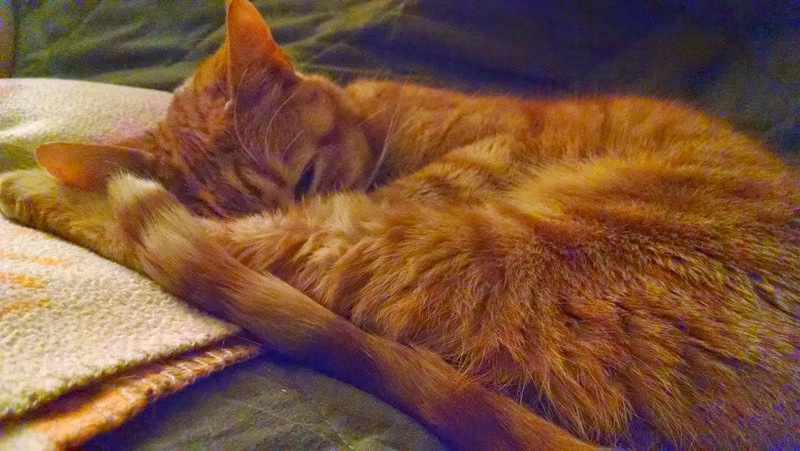 "Da Da Da ich lieb dich nicht du liebst mich nicht aha aha aha" -- usually better known by its shorter name, "Da Da Da." That song wasn't heard in the US until it was re-released on the band's second album, Trio & Error (1982). 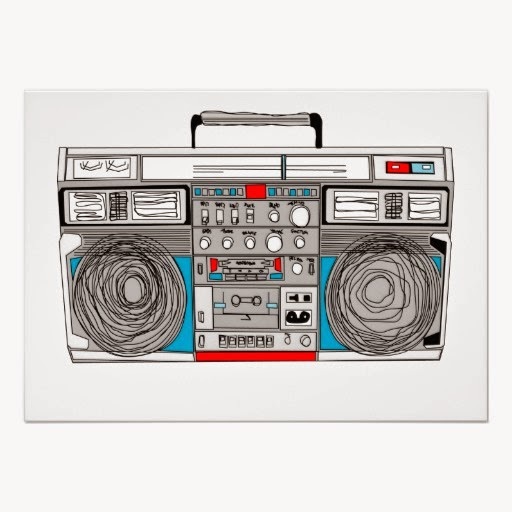 I didn't hear "Da Da Da" until about 1986 or 1987. 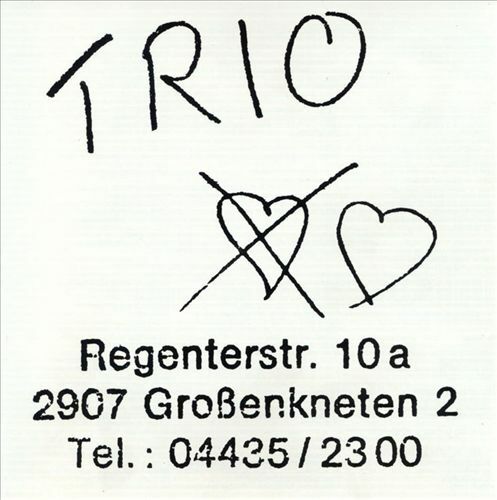 And when I first heard it, I was under the impression that Trio was a man, a woman, and a Casio keyboard. But ... nope. The band was three dudes named Stephan Remmler, Gert Krawinkel, and Peter Behrens. They recorded four albums together, and released about 10 singles, but they're pretty much known only for "Da Da Da." It was a hit in over 30 countries, and resurfaced in the 1990s for a Volkswagen commercial. See the original "Da Da Da" video and hear more Trio tracks after the jump. If you're only familiar with their bit hit, you might be surprised to hear their more rocking side. [This Week's Hot 100] -- In July of 1988, I was enjoying my second summer as a college student. However, I was back in my hometown rather than my college stomping grounds, so "enjoying" might be a bit of an overstatement. 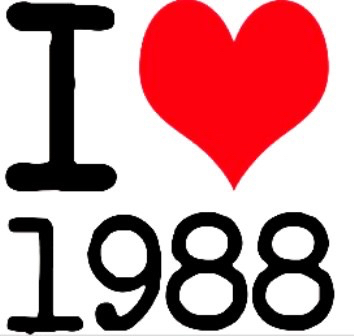 I can say I definitely enjoyed the sounds of the summer of 1988. I cranked the tunes during my shifts at the community pool's snack bar, and on my Sony Walkman when I had to run the mower around the pool's grounds. This week on the Flashback, we're going to look back upon the top three songs on the U.S. Billboard Hot 100. Do you recall what topped the chart 28 years ago this week? Read and hear more after the break! Why did we wait so long to see this movie? (We've had the DVD since 8/25/15). Quick review: Great music. Great camera work. 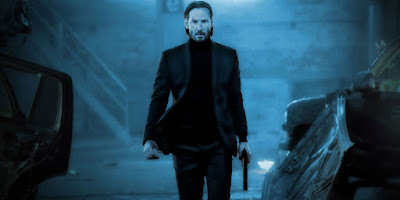 And Keanu is at his monotone best. Buckle up and enjoy the ride. This film depicts the senseless death of a puppy. But if you've read any synopsis of this flick, then you already know that John Wick comes out of retirement to get the dirtbags who killed his puppy, the last gift from his late wife. I'm just letting you know that the puppy's death is in the film so you're braced for it. And, believe me, it is worth getting through that scene in order to embrace the rest of the movie. [Red, White, and Bruised ... er, Blue! Redux] -- The Fourth of July lands on a Monday this year, so many wage earners in the U.S. are given a three-day weekend to celebrate a unique event: when 13 scrappy, English colonies engaged in an act of civil disobedience. Well, it was actually an act of treason. And it was committed by writing a sternly worded letter to King George III, who wouldn't receive his copy until August 30, 1776. Now, I don't know what the Founding Fathers would make of this week's playlist. But there will be plenty of serious fare discussing the events of 1776 on the web, radio, and television. So on the Flashback, we're gong to cut loose and have some fun. If you're ready to celebrate with me in 80s rock style, then read and hear more after the break. We'll enjoy a few tracks that somehow have a little red, white, or blue associated with them. Please note, I'm re-using a post/playlist is a slightly modified version of the one that originally appeared on Prophet or Madman on July 4, 2014. But, hey, these songs are over 20 years old anyway, so there shouldn't be any problem with me recycling a year-old blog post, right? If you agree, you can read and hear more after the break.